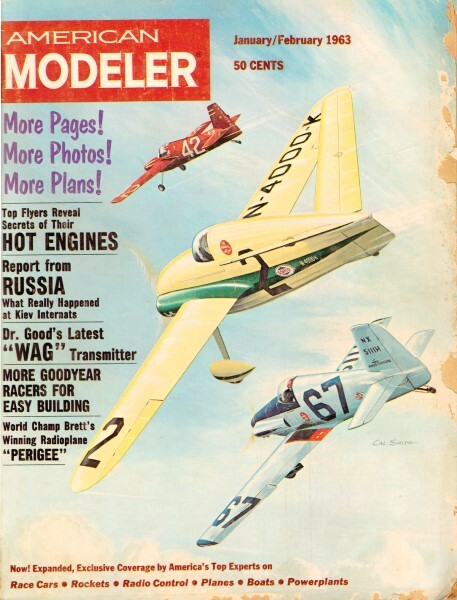 Just as originally intended, a lot of people have contacted me after seeing themselves, a friend, or a family member mentioned in one of these articles published in vintage American Modeler and American Aircraft modeler magazines. 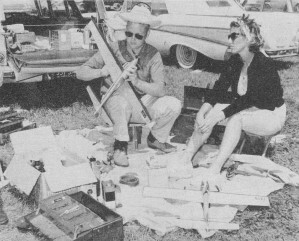 Often, it came as the result of reporting on a modeling event, like the "Mid-America Stunt Championships" covered here in "Wild Bill Netzeband's Control Line Capers" column in the January / February 1963 AM. Do a site-wide search of Airplanes and Rockets to see if your name appears somewhere. 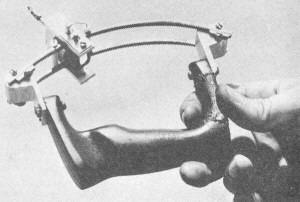 Also in the article is a report of Veco's new 35C and also on a game-changing monoline control handle for C/L racing. A comical "Things You Wouldn't Know" section is included to provide the "real" meaning of words used by modelers. 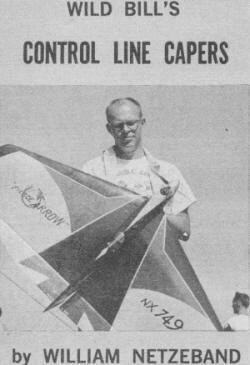 Did you know that Bob Violett and Cliff Telford of R/C racing fame did C/L racing as well? Will this "one-hand" handle revolutionize one-line flying? Excellent detail on C/L Gulfhawk at Westchester Flying Fair. 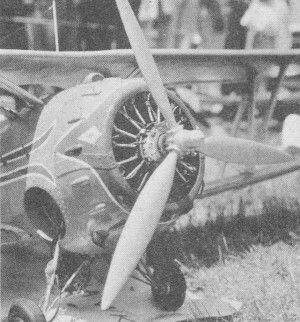 Dummy engine is Monogram's Wright Cyclone. Ambroid's Art Laneau directed AYSC finals, congrats all-'round A YSC champ David Fox. Rolland McDonald takes off Fox .35 stunter (right). 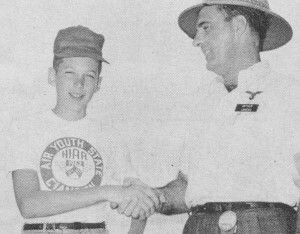 See his sharp 3-wheel "Challenger" in Oct/62 A.M.
At Nats Ed Kammerer (left) was 2nd in Sr Stunt with 54" "Apollo"; 44-oz; Fox 35; he's from Cleveland. 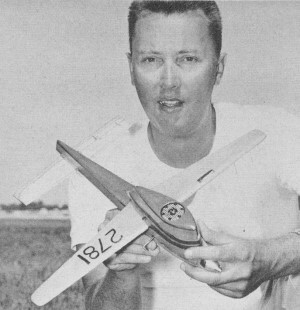 Dubby Jett of Dallas, Texas, holds his original Proto Special which took first in Senior at Nats with 124.69-mph. Jett's entry mounted a Fox 29X for power. He's 16, has been flying models for 8 years, aims to be a math teacher. In his column this, issue Wild Bill asks that C/Line fans not be too wild around overhead wires! Poster is supplied to schools by Canadian electrical power firms. Working on original Nats Proto Speed plane (left) is Bob Violett of Hyattsville, Md. ; has Super Tigre 29. Pat Pennoyer, also from Maryland, lends encouragement. Original Class B speed National meet entry above, first in Open category with 154.44-mph, is work of Walter Bellmer of Franklin Square, N. Y.
Bellmer and top B; Fox 29X, homemade front-back plates. Nice piece of woodwork raced off to top place in National Class C competition: 167.84-mph for Cliff Telford, Falls Church, Va. Original with modified McCoy .60; mahogany/bass; Stegans 9 1/2 /11 prop. 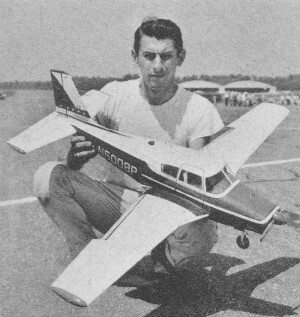 Second in Nats Adult Stunt: Jim Silhavy with Fox 35 Nobler, 44-oz. 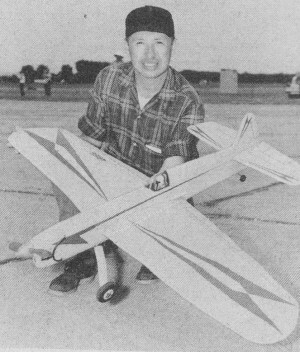 Best Open jet was by Harold Nash, High Point, N. C., pilot, Bill Pardue, Greenboro, N. C., mechanic. Dyna-Jet "Lil' Burp" is '53 design by Bill. 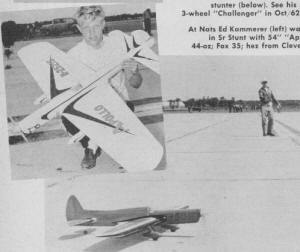 Beauty Event winner at Westchester Flying Fair was original Comanche: F. S. Piorkowski, Enola, Pa.; K&B 35. "Uniline" handle prototype? At the TGD Annual, John O'Dwyer of Arlington, Texas (2120 Cloverdale), showed a one-handed, single line control unit that really works. Consisting of a pair of radiused racks, bevel gears with Teflon guides and a handle, this device appears to offer tremendous possibilities, particularly for FAI speed (and old-like U-Control pilots). John has been successfully flying a small Flite Streak which has a matched plane unit. Latter is ball bearing suspended with no torque centering, which could eliminate the weak link in present systems. Aerodynamic centering has been adequate so far. John plans dual spring centering on pushrod for speed units, with an A ship under construction. Take-off is simply accomplished, two-handed, by holding block and working handle thru it. 1962-'63 crop of Air Youth State Champs gathered at Nationals included feminine state winner. As centrifugal force develops, the gear block centers itself and control is accomplished conventionally by up and down motion. A bonus occurs, since up and down airplane oscillations produce counter-control action automatically. Patent search under way by Bell Helicopter ... where John is a design engineer. John says he'll be happy to provide individuals with details. This little device may lead the way toward "no whip" speed and better FAI speeds, as well as simpler transition from 2-line to mono (Uni). John promised to keep us informed of developments. Was Gil Ready? Yes, Sir! Detroit, Mich., Invitational Combat Championship is reported by John Kilsdonk (19473 Ward, Detroit 35). Starting out with 5 juniors and 13 Sr-Op combat winners they ended up with 75 flights and 51 wrecked ships. Initially 3 groups of 6 with each flyer making 5 flights in his group. Three winners flew each other and second placers flew off three at-once for 4th and 5th. Score based on 50 pts per cut and 1 point per sec in air during 5 minute period. 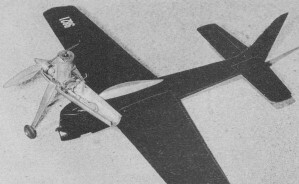 Tufted streamers bunched up due to swivel problems so standard "no-collision" zone type were whipped up. No kill. Evidently unlimited substitution of models, lines etc allowed during match since Dave Keats made a 5 sec pit stop in final match by picking up another running ship. He used up 6 (count-em) in another match! 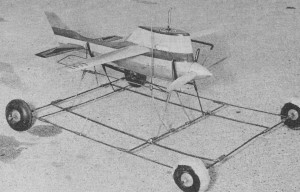 Gil Ready flew with Popsicle stick engine braces in a match. Dave Keats also won the "daisy cutter" award by flying inverted under Tom Hackett (who was at 2') and' got a cut, too. Then there was the Jerry Martin and Ted Cooper match with 5 mid-air contacts Jerry used one plane, Ted two altho each had ultimate scrap. Gil Ready emerged champion; he's from Troy, Ohio. The flyers were all invited ... this Detroit crew suggests their system be used regionally to screen (like thru a mixmaster) combat flyers for the Nats. Entry fees were collected in advance and except for extra streamer cost, they came out even including trophies. This set-up is really "Brave Men's Combat." Here at CLC we'll be glad to collect your opinions and report results. Let's hear ... hey? Mid-America Stunt Championships. With hardware and merchandise from 18 model industry firms and custom trophies by the Lexington (Ky.) MAC, the stunt guys had a real old-fashioned wing-ding last Sept. An idea catching fire is the single-event contest with lots of flying in your specialty. Should see more of this. 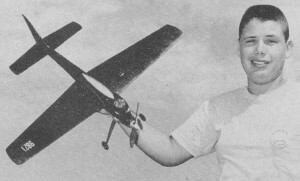 Lew McFarland reported fine weather, lo breezes and many championship-caliber flights. In Junior John Davis had his own way, but Sr. and Open were hotly contested. Bill Werwage beat out Eddie Kammerer in Senior using a 45 powered Super Ares. 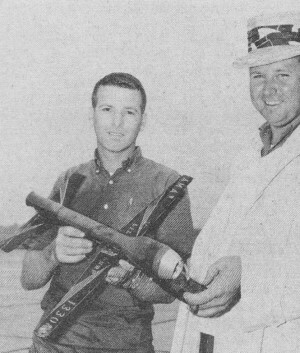 Charlie Lickliter finally topped Melvin Miller, Charles Reeves and Bob Randell with the last -Open flight of the day and his own fourth go-round (a 566), Reeves and Miller tied officially at 563 and flew it off with Reeves scoring another 563 and Miller coming through with 572. Real tight flying and judging with 3 judges per circle and 6 on fly-offs. Interesting item from Lew, who started it all: The 45's are taking over with Werwage flying one ... Randell, John Davis and Lickliter designing toward. A note from Bob Gialdini indicates his interest. Veco now offers their 45 without throttle for Stunt. Anyhow, everyone got a prize and those trophies sounded yummy. Veco 35C Preliminary Test. When Veco supplied this test engine they requested 4 to 6 hours running before results were taken. Not quite there yet, but feel that it should be covered now. A sleeve bearing engine with lapped piston, reasonably conventional in layout, it is exceptionally easy to operate. Needle valve range on pressure (Veco Ball Check Tank) is excellent and non-critical. Starting is easy (one flip cold with exhaust prime) and only a few flips hot. Since it is still tight, it floods sometimes. Running on 9x7 Tornado in a Jerkline it knocks off 88 per on K&B 1000 showing potential comparable to the current crop of "cod burners." Cylinder timing is average; Exhaust Total 150 degrees, Intake Total 128 degrees. Shaft timing from open at 23 ABDC and close at 40 ATDC for 197 total. Intake bore at NV is .345 and a restrictor to .270 diameter is provided. We're looking forward to trying this on "Blast" since Veco engines dote on nitro and the more the merrier. All told a good solid, no kink, vibration free, hot combat and R/R power plant. You'll have to build around it or rework any existing mounting bolt arrangement. With the tight original fitting-up of parts a long break-in period is mandatory, but it will stay up on peak a long time. Besides, it will fly with only 1/2 hour bench time. "Hurricane" Stunter by Palmer & Veco. Received 3-lb C/Line box of goodies so cleared bench forthwith. Examination showed clean die work and machining plus massive decals, clear plans and full-house hardware collection. Veco is the only company who can recommend its own products from bellcrank thru wheels, spinner, extension, engine, tank and tubing. Only non-Veco items: engine mounting nuts and leadout wires (well, dope, too). Had a pleasant time checking all items on the supplied check list. Procedures are clear and offer boxes so you can check off steps as accomplished. Die cutting has been applied only where practical and is outstandingly accurate. Frame assembly is a real joy. D-tube wing (with dihedral) goes together neatly. Fully, closed torque box leading edge is very stiff. Differential flap horns are provided and the new pushrod lash-up is straight forward. The whole deal shows accurate engineering and layout effort, as well as thoughtful wood selection. We will give it a 3/4 "full-house" finish and submit flight reports soon. Kit priced $11.95, qualified for semi-scale competition, 590-sq-in area, 54" span for .35 engines. (Should be good with a .40 to .45, too). New Look in Wood Shaping. You kids and old kids who don't like carving with knives try some of Armour's "Garalun Cabinet Paper." This new abrasive coated paper in 60D-1/2 grain is the "cut's pajamas." (Okay, so it's corny). Also stamped on back is "No Load" and they kid you not. This isn't a coarse grit, but it is sharp and spaced well. Control is excellent and cuts made with it can be finished by light passes with #240 Wetordry followed by polish with #400. If you want fast cuts just lean on it and get your feet off the floor. Finally, it should maybe last you forever. Available at Sears Roebuck and probably some hardware and lumber yards. By the by, when sanding - use a flat block or a firm sponge pad. Hand sanding rounds edges and cuts soft areas deeper than adjacent hard areas. On the top surface of covered wings and tail surfaces a block is mandatory. Get with it! Unbeaten - Not entered in, any contests yet. A Classic Design - It's out-of-date, but we've got 10,000 in stock. Thoroughly Flight Tested - One of the boxed kits fell off a table and didn't break. A cinch To Start - They have run. Stunt-Combat-Sport-Scale & Carrier For .049 To .65 Engines - It did a loop with a full-house Mac 60. Be the First In Your Neighborhood, etc - Please!!! Micromeccanica Saturno Attenzione. I finally got the G21/35 BB F in a combat ship complete with pressure tap and large intake. This is one of the most docile fire-breathin' powerhouses around today. On pressure with 9x7 Tornado prop it has no less than 1 1/2 turns NV tolerance and follows real well. With MM fuel and Johnson plug on a cool day we cranked out 94-96-95-mph runs with full facility for wringing out. One flip ... hot or cold starts. Please, fellows, don't change this one. It's right on. Helpful Words. A new engine, during and due to breaking in, is a brutal machine. We mean on fuel gulping, plug chomping and finger-snapping. Until the parts get mated, things are literally rough. It's natural and will go away soon. Remember, short runs with complete cooling between. After 1/2 hr to 45 minutes on bench, fly it rich. S' well worth the effort. Thought For The Month. Don't be discouraged ... you can always serve as the horrible example to inspire others. Oh, Yes ... Plumb forgot to explain that it strikes me funny to see these pictures of J. Doaks, modeler, in his shop. Area is always so neat, you know he either just cleaned up, or he doesn't do anything. So we decided to face facts. Still getting pies. Such sloppy housekeepers! Tsk. One other clarification. When we use your ideas we give credit right there. If no credit is given, the thought etc is ours. Oke? Incidentally, our engine data this issue is just the start of to-be-continued informative speed information. Will cover the ball of wax before we're done, from dollies to donuts. To compute speed by single lap clocking with slide rule use following constants divided by time in seconds: 42'-180; 521/2'-224; 60'-257; 65'-278; 70'-300. A Shocking Experience. 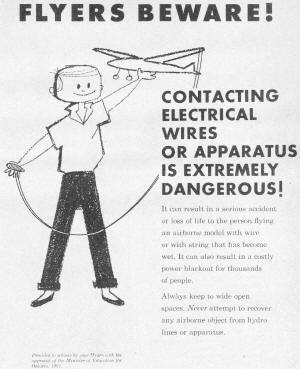 Much is said about not flying near electric (hydro) power lines, but it keeps happening. A few more facts might help. Those big lines supported from steel towers usually carry 33,000-plus volts, quite capable of jumping a 3-inch air gap under perfectly dry, sea level conditions. If you're standing wet, the air is moist and rain is imminent, the jump is much greater. 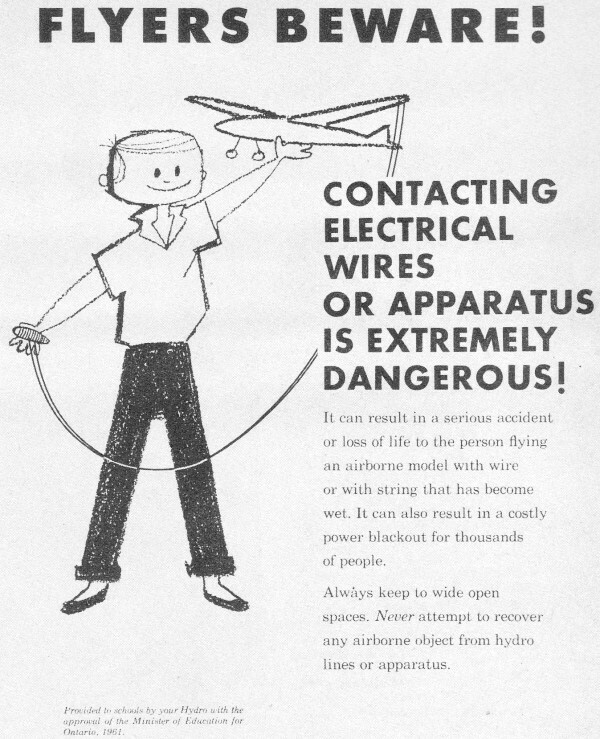 Remember ... your plane or lines don't have to touch the livewires! Flying out in the open before, during or after a thunderstorm is inviting the undertaker. Incidentally if you start getting shocked, quickly fly low and ground yourself by touching the lines. Insulation merely allows a large charge to build up and then Pow! 6-Minute Barrier Approaches. "Sonic Barrier," the 4-minute mile 100-mph on a surf board, the Rat Racers have their own 6-minute (100-mph average) barrier to crack. Be an "odds figurer" - what targets do we shoot at? Since the take-off lap usually takes 5-sec, we have 15 seconds soaked up in 3 laps. The fastest you could get a ship on the ground for pit stops is about 2 seconds, if she quits 1/2 lap from pit crew and you break the glide quickly, "hitting" the crew at about 20-mph. This we've done. Then give the crew 5 seconds for each refueling. There went 29 seconds. Your total must be 360 seconds. Hokay, schport ... leaves 330 seconds of high speed running for 136 laps. Speed 106 mph. This is your "Target Speed." Anything slower, no chance. Conversely, anything over 106 IF you don't sacrifice pit stops is gravy. We have assumed clocking from take-off, not a LeMans start. Another statistic based on a 10 second 100 yard dash: pit crew speed is 20.5-mph max, more like 15-mph or 22-ft/sec. If he must run 1/2 lap on 75 ft radius he'll take 11 seconds. Pilots, learn to spot your landings, they're money in the poke. So, finally, rather than soup your engine, work on sharp pit work and fast restarts, spot landings and consistent non-erratic flying. THEN soup your engine and let us know when, where and what with you hurdled the 6 minute barrier.